This site is dedicated to the Truth of the Messiah Yeshua and defending against the falsities of the World. One of the most argued yet most misunderstood points that an atheist or agnostic will make against the Creator, is that he is an unjust and wrathful God that shows no mercy. One of the biggest reasons that they view Him in such a manner is because of something even most Christians do not know. This article will in depth explain why YHVH instructed the Israelites to slay every man, woman, child, and even the flocks of animals of their enemies and YHVH’s enemies when they crossed the Jordan and entered the Land of Canaan. When Yahoshua/Joshua lead the Israelites into the Land of Canaan, YHVH commanded the Israelites to slay every man living being in that land, but WHY did he instruct the Israelites to do this? Surely we know our YHVH, our Creator, as a just, loving, and merciful God, so why would he give these harsh instructions? Was it because Israel was promised a land and that they were the rightful owners? Well, yes, but there is far more to this than the untrained or blinded eye can see, he had a very just and valid reason for giving these instructions. Let us look at what he told the Israelites. Deu 7:1 “When the LORD your God brings you into the land that you are entering to take possession of it, and clears away many nations before you, the Hittites, the Girgashites, the Amorites, the Canaanites, the Perizzites, the Hivites, and the Jebusites, seven nations more numerous and mightier than yourselves, 2 and when the LORD your God gives them over to you, and you defeat them, then you must devote them to complete destruction. You shall make no covenant with them and show no mercy to them. 3 You shall not intermarry with them, giving your daughters to their sons or taking their daughters for your sons, 4 for they would turn away your sons from following me, to serve other gods. Then the anger of the LORD would be kindled against you, and he would destroy you quickly. 5 But thus shall you deal with them: you shall break down their altars and dash in pieces their pillars and chop down their Asherim and burn their carved images with fire. 6 “For you are a people holy to the LORD your God. The LORD your God has chosen you to be a people for his treasured possession, out of all the peoples who are on the face of the earth. 7 It was not because you were more in number than any other people that the LORD set his love on you and chose you, for you were the fewest of all peoples, 8 but it is because the LORD loves you and is keeping the oath that he swore to your fathers, that the LORD has brought you out with a mighty hand and redeemed you from the house of slavery, from the hand of Pharaoh king of Egypt. 9 Know therefore that the LORD your God is God, the faithful God who keeps covenant and steadfast love with those who love him and keep his commandments, to a thousand generations, 10 and repays to their face those who hate him, by destroying them. He will not be slack with one who hates him. He will repay him to his face. 11 You shall therefore be careful to do the commandment and the statutes and the rules that I command you today. 12 “And because you listen to these rules and keep and do them, the LORD your God will keep with you the covenant and the steadfast love that he swore to your fathers. 13 He will love you, bless you, and multiply you. He will also bless the fruit of your womb and the fruit of your ground, your grain and your wine and your oil, the increase of your herds and the young of your flock, in the land that he swore to your fathers to give you. 14 You shall be blessed above all peoples. There shall not be male or female barren among you or among your livestock. 15 And the LORD will take away from you all sickness, and none of the evil diseases of Egypt, which you knew, will he inflict on you, but he will lay them on all who hate you. 16 And you shall consume all the peoples that the LORD your God will give over to you. Your eye shall not pity them, neither shall you serve their gods, for that would be a snare to you. 17 “If you say in your heart, ‘These nations are greater than I. How can I dispossess them?’ 18 you shall not be afraid of them but you shall remember what the LORD your God did to Pharaoh and to all Egypt, 19 the great trials that your eyes saw, the signs, the wonders, the mighty hand, and the outstretched arm, by which the LORD your God brought you out. So will the LORD your God do to all the peoples of whom you are afraid. 20 Moreover, the LORD your God will send hornets among them, until those who are left and hide themselves from you are destroyed. 21 You shall not be in dread of them, for the LORD your God is in your midst, a great and awesome God. 22 The LORD your God will clear away these nations before you little by little. You may not make an end of them at once, lest the wild beasts grow too numerous for you. 23 But the LORD your God will give them over to you and throw them into great confusion, until they are destroyed. 24 And he will give their kings into your hand, and you shall make their name perish from under heaven. No one shall be able to stand against you until you have destroyed them. 25 The carved images of their gods you shall burn with fire. You shall not covet the silver or the gold that is on them or take it for yourselves, lest you be ensnared by it, for it is an abomination to the LORD your God. 26 And you shall not bring an abominable thing into your house and become devoted to destruction like it. You shall utterly detest and abhor it, for it is devoted to destruction. Deu 3:1 Then we turned, and went up the way to Bashan: and Og the king of Bashan came out against us, he and all his people, to battle at Edrei. 2 And the LORD said unto me, Fear him not: for I will deliver him, and all his people, and his land, into thy hand; and thou shalt do unto him as thou didst unto Sihon king of the Amorites, which dwelt at Heshbon. 3 So the LORD our God delivered into our hands Og also, the king of Bashan, and all his people: and we smote him until none was left to him remaining. 4 And we took all his cities at that time, there was not a city which we took not from them, threescore cities, all the region of Argob, the kingdom of Og in Bashan. 5 All these cities were fenced with high walls, gates, and bars; beside unwalled towns a great many. 6 And we utterly destroyed them, as we did unto Sihon king of Heshbon, utterly destroying the men, women, and children, of every city. 7 But all the cattle, and the spoil of the cities, we took for a prey to ourselves. Now, many could argue that this is a cruel and unjust way of doing business IF it is taken out of context. The issue is that most people, including most of modern Mainstream Christianity, have no idea WHY the women, children, and men, all of them, were destroyed. What most do not know, due to lack of reading, and also a very bad doctrine that comes from Seminaries all over the World, is that before the flood, the Fallen Angels mated with women, making a hybrid race called the Nephilim. 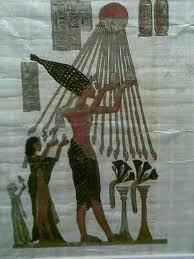 The Angels that rebelled against YHVH(God) in the beginning took for themselves human wives and bore offspring Giants. All the Greek myths and Heroes, the Egyptiann giants, and the myths from all the various Pagan cultures of the Ancient World are all based in this Truth, they were not simply the allegories of ignorant men who wanted to tell a tall tale. Much of it is based in Truth, but as we know, there are two sides to every coin and two sides to every story, so today, we will give the Biblical accounts that record this race that did indeed descend from extra-terrestrial places. Gen 6:4 There were giants in the earth in those days; and also after that, when the sons of God came in unto the daughters of men, and they bare children to them, the same became mighty men which were of old, men of renown. 5 And GOD saw that the wickedness of man was great in the earth, and that every imagination of the thoughts of his heart was only evil continually. 6 And it repented the LORD that he had made man on the earth, and it grieved him at his heart. 7 And the LORD said, I will destroy man whom I have created from the face of the earth; both man, and beast, and the creeping thing, and the fowls of the air; for it repenteth me that I have made them. Now, it says that the sons of God came into the daughters of men. Most Pastors trained in Seminary will teach that this is speaking of the line of Seth. There are far too many holes on this argument, the first being, how did the Sons of Seth breed with women, and cause them to bear GIANTS????? The Sons of Seth were righteous men, men of a good standing with YHVH, it was Noah, who found Grace in the eyes of YHVH, that was preserved while the Earth was being destroyed by water because of the sins of both men and these Fallen Angels, and their offspring, the Nephilim, or, Giants. Noah was a descendant of Seth. He was no Giant. The phrase “sons of God” in Hebrew is “ben Elohim” in Hebrew, and means “born or bore of God/gods”. Elohim is a plural word, so it can mean both Angel, and it can be used as God. Every time this phrase “sons of God” is used in the Tenahk/Old Testament it is speaking of Angels. We have already seen in Genesis where this phrase “ben Elohim” or “sons of God” is used, so by the law of first mention, the same theme and definition should carry out throughout the scriptures. Let us look at the other times this phrase is used. Job 1:6 Now there was a day when the sons of God came to present themselves before the LORD, and Satan came also among them. 7 And the LORD said unto Satan, Whence comest thou? Then Satan answered the LORD, and said, From going to and fro in the earth, and from walking up and down in it. Job 2:1 Again there was a day when the sons of God came to present themselves before the LORD, and Satan came also among them to present himself before the LORD. 2 And the LORD said unto Satan, From whence comest thou? And Satan answered the LORD, and said, From going to and fro in the earth, and from walking up and down in it. Job 38:6 Whereupon are the foundations thereof fastened? or who laid the corner stone thereof; 7 When the morning stars sang together, and all the sons of God shouted for joy? These are the only times from the Tenahk/Old Old Testament in Hebrew that we find this pharse. Every time it is speaking of the Angels. Not one time is the sons of Seth known anywhere in the scriptures as “ben Elohim”. They are always called the sons of Adam, or, “Ben Adam” in Hebrew, and it means sons of men or son of Man. So, why does this have anything to do with the destruction of supposed innocent women and children? Well, the Nepilim, or the race of hybrid Angel/men were a very violent and wicked race, born in rebellion by the Fallen Angels of YHVH. The reason the Earth was destroyed was because this race had corrupted all flesh except for Noah and His sons. Gen 6:12 And God looked upon the earth, and, behold, it was corrupt; for all flesh had corrupted his way upon the earth. 13 And God said unto Noah, The end of all flesh is come before me; for the earth is filled with violence THROUGH THEM; and, behold, I will destroy them with the earth. It says here that the Earth was filled with violence through them. 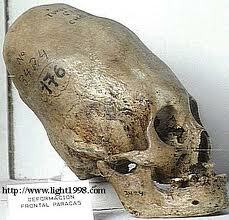 We also know that there was another outbreak of these beings after the flood. Gen 6:4 There were giants in the earth in those days; and also after that, when the sons of God came in unto the daughters of men, and they bare children to them, the same became mighty men which were of old, men of renown. This race of beings was in direct opposition and rebellion against God. They were abominations bore through a forceful and very cruel group of Angels who openly rebelled against YHVH led by Satan. Goliath, Og King of Bashan, and others like them ruled the Land of Canaan through violence and wrath against men, and almost before the flood completely perverted the Created Man YHVH Created in the Garden. There were but 8 preserved through Noah’s Ark. Satan had planted tares in the land of Canaan, so when the Israelites entered the Land, the instructions of YHVH were to kill all their descendants. 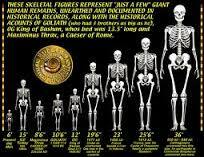 All of the “-ites” were descendants of these races of Giants. Num 13:29 The Amalekites dwell in the land of the south: and the Hittites, and the Jebusites, and the Amorites, dwell in the mountains: and the Canaanites dwell by the sea, and by the coast of Jordan. 30 And Caleb stilled the people before Moses, and said, Let us go up at once, and possess it; for we are well able to overcome it. 31 But the men that went up with him said, We be not able to go up against the people; for they are stronger than we. 32 And they brought up an evil report of the land which they had searched unto the children of Israel, saying, The land, through which we have gone to search it, is a land that eateth up the inhabitants thereof; and all the people that we saw in it are men of a great stature. 33 And there we saw the giants, the sons of Anak, which come of the giants: and we were in our own sight as grasshoppers, and so we were in their sight. Had the race not been wiped out, man would not be here today. The Earth would be filled with Abominations, nothing of the man YHVH created would be left. This is the WHY portion of the mystery. YHVH had to detroy all these left over Giants and their descendants so that we, man, could be preserved and have dominion over this Earth as intended in His Creation plan. Enoch, Noah’s great- Grandfather spoke of these Angels that rebelled and taught men all the wickedness of making weapons of War, teaching women to use cosmetics, and even spoke of the Fallen teaching men how to destroy babies while still in the womb(abortion). The Book of Enoch is considered a part of the Apocrypha, or, non-Canonized texts of the Bible, but it is quoted several times in our Canon. Enoch was said to have walked with YHVH, and the Book that bears His name goes into great details about not only the first time the Angels rebelled and also of a second rebellion which the Messiah also speaks about in our Holy Scriptures. He says that as in the days of Noah were, so shall it be when he returns. Luk 17:26 And as it was in the days of Noe, so shall it be also in the days of the Son of man. 27 They did eat, they drank, they married wives, they were given in marriage, until the day that Noe entered into the ark, and the flood came, and destroyed them all. 28 Likewise also as it was in the days of Lot; they did eat, they drank, they bought, they sold, they planted, they builded; 29 But the same day that Lot went out of Sodom it rained fire and brimstone from heaven, and destroyed them all. Most people, because they do not notice the important details that the Messiah is giving us here, assume that homosexuality is the sin that he is speaking of with the days of Lot, but we know from the Genesis account it was not merely homosexuality, but the evil men of Sodom and Gamorah wanted to have sexual relations with the Angels of YHVH. Gen 19:1 And there came two angels to Sodom at even; and Lot sat in the gate of Sodom: and Lot seeing them rose up to meet them; and he bowed himself with his face toward the ground; 2 And he said, Behold now, my lords, turn in, I pray you, into your servant’s house, and tarry all night, and wash your feet, and ye shall rise up early, and go on your ways. And they said, Nay; but we will abide in the street all night. 3 And he pressed upon them greatly; and they turned in unto him, and entered into his house; and he made them a feast, and did bake unleavened bread, and they did eat. 4 But before they lay down, the men of the city, even the men of Sodom, compassed the house round, both old and young, all the people from every quarter: 5 And they called unto Lot, and said unto him, Where are the men which came in to thee this night? bring them out unto us, that we may know them. 6 And Lot went out at the door unto them, and shut the door after him, 7 And said, I pray you, brethren, do not so wickedly. 8 Behold now, I have two daughters which have not known man; let me, I pray you, bring them out unto you, and do ye to them as is good in your eyes: only unto these men do nothing; for therefore came they under the shadow of my roof. 9 And they said, Stand back. And they said again, This one fellow came in to sojourn, and he will needs be a judge: now will we deal worse with thee, than with them. And they pressed sore upon the man, even Lot, and came near to break the door. 10 But the men put forth their hand, and pulled Lot into the house to them, and shut to the door. 11 And they smote the men that were at the door of the house with blindness, both small and great: so that they wearied themselves to find the door. The entire “Ancient Aliens” theory is one of Satan’s schemes to trick us into believeing that these Fallen Angels are our Creators, AGAIN! Yes, I said again. The rebellion that occurred in the beginning and the one that occurred in Babylon after the flood was not simply a rebellion against the commandments of YHVH, it was an outright attempt to pervert the entire creation with these hybrid beings. These are the Heroes of the Greeks, such as Hercules. The commandment not to mix diverse seed comes to mind in a slightly different light once you understand this concept. The Fallen Angels demanded Worship of men, in direct defiance against YHVH. This is what ALL again ALL Pagan religion is based upon, and the reason they have so many “gods”. They were worshipping the Angels that rebelled against YHVH, not the Creator. This is the true line that separates the True Worship of YHVH from the false systems of worship. The idea is for Satan to get us by any means necessary to worship the Crated beings instead of the Creator Himself. Satan wants to be like the Most High, his jealousy and Pride is what leads Him. Isa 14:12 How art thou fallen from heaven, O Lucifer, son of the morning! how art thou cut down to the ground, which didst weaken the nations! 13 For thou hast said in thine heart, I will ascend into heaven, I will exalt my throne above the stars of God: I will sit also upon the mount of the congregation, in the sides of the north: 14 I will ascend above the heights of the clouds; I will be like the most High. 15 Yet thou shalt be brought down to hell, to the sides of the pit. The Book of Revelation speaks of a future rebellion lead by Satan and His Angels after they are cast to the Earth as well. It will be Satan’s final assault against the Kingdom of YHVH. Rev 12:7 And there was war in heaven: Michael and his angels fought against the dragon; and the dragon fought and his angels, 8 And prevailed not; neither was their place found any more in heaven. 9 And the great dragon was cast out, that old serpent, called the Devil, and Satan, which deceiveth the whole world: he was cast out into the earth, and his angels were cast out with him. 10 And I heard a loud voice saying in heaven, Now is come salvation, and strength, and the kingdom of our God, and the power of his Christ: for the accuser of our brethren is cast down, which accused them before our God day and night. 11 And they overcame him by the blood of the Lamb, and by the word of their testimony; and they loved not their lives unto the death. 12 Therefore rejoice, ye heavens, and ye that dwell in them. Woe to the inhabiters of the earth and of the sea! for the devil is come down unto you, having great wrath, because he knoweth that he hath but a short time. The whole premise of the false religious systems is designed to deceive you into worshipping the Angels instead of YHVH Himself. This is warned against in the book of Colossians. This philosophy is all based on the commandments and traditions of men. Col 2:18 Let no man beguile you of your reward in a voluntary humility and worshipping of angels, intruding into those things which he hath not seen, vainly puffed up by his fleshly mind, 19 And not holding the Head, from which all the body by joints and bands having nourishment ministered, and knit together, increaseth with the increase of God. 20 Wherefore if ye be dead with Christ from the rudiments of the world, why, as though living in the world, are ye subject to ordinances, 21 (Touch not; taste not; handle not; 22 Which all are to perish with the using;) after the commandments and doctrines of men? 23 Which things have indeed a shew of wisdom in will worship, and humility, and neglecting of the body; not in any honour to the satisfying of the flesh. There are Angels amongst us even today, we must be careful in how we entertain strangers. Heb 13:1 Let brotherly love continue. 2 Be not forgetful to entertain strangers: for thereby some have entertained angels unawares. The reason I wrote this is to inform the many misunderstood people who accuse YHVH of being an unjust and wrathful God, not showing any mercy to women and children. It was my intent to inform you of the correct context and history of our life on the planet we call Earth, so that you are not so easily deceived. This is one of the most often misunderstood parts of the scriptures that need to be addressed, because when YHVH commanded the Israelites to slay every man, woman, and child, he was doing it out of love for His own Creation, His Children who will one day again walk with Him when he dwells among us. Before that day can happen, unfortunately there will come a period of testing and trial, when Satan and His Angels who masquerade as “aliens” or “extra-terrestrials” will be once again here among us in the open, trying to deceive us into the idea that they are our Creators. Many many movies in Hollywood are already pushing this agenda. Promethius is the one to me that stands out the most. All men, believers and unbelievers will be given the opportunity to choose who they will bow to, the Creator, or His rebellious Children trying to usurp their Father and Creator. I pray that anyone reading this will relook at their ideals on who YHVH)God) is, and who he is not, because what he is not and who he is not is an unjust and wrathful God who only wants submission by force. He is a loving Father who is trying to protect His Children from the enemies of all Creation, in order that they all be saved from the judgment and wrath to come. Yeshua/Jesus is the ONLY door to eternal life, and I pray that any man who truly wants what all men want, peace, safety, and love, will accept Him as their Savior and their King, because very soon, Satan will be unleashing His final assault against Humanity and most will accept His rule instead of the righteousness of YHVH. I pray that your eyes have now been opened just a little more, in the name of Yeshua HaMosciach/Jesus Christ, Amein Amein! Hos 4:6 My people are destroyed for lack of knowledge: because thou hast rejected knowledge, I will also reject thee, that thou shalt be no priest to me: seeing thou hast forgotten the law of thy God, I will also forget thy children. WOW!! Thank you for this!